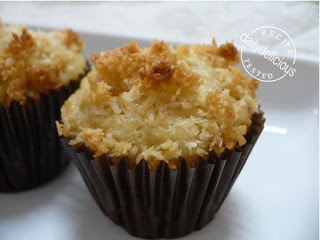 Coconut is very fragrance when bake and I like the crunchy feeling it gives from this muffin plus this one is very easy to make. I got this recipe from my aunt who loves to bake and she gives me this recipe, I love it from the first time that I taste it, she told me that this is her favorite too. I like baking them in a mini muffin tin, because I will get more coconut crunchy top. The muffin is not too sweet and filled with a lovely coconut fragrance (we use both desiccated coconut and coconut milk) it’s good to have as the morning treats or with a good tea in the afternoon. Preheat oven to 180°C. Line 24 mini muffin cups with paper cups. Set aside. Mix coconut with brown sugar and 3 tbsp melted butter, take out 3 tbsp of the mixture for using as topping. Sift flour, sugar, baking powder, baking soda, and salt into large bowl and mix with coconut mixture. Set aside. In small bowl beat egg and stir in remaining ingredients. Add to flour mixture and stir just until dry ingredients are moistened. Some small lumps will remain in batter. Do not overmix. Fill prepared muffin cups two-thirds full, and sprinkle the coconut mixture on top. Bake for 20 to 25 minutes or until toothpick inserted in center of muffin comes out clean. So LOVELY! Congrats on your first challenge! In every issue we have some recipes and in this issue I would like to have some coconut recipes. As I was searching on the Internet, I came upon your blog and I like it very much. I would like to ask you to publish some recipes of yours, namely the mini coconut muffins one right now. I will put a link to your blog in the magazine, along with the recipe. If you agree, please get back to me as soon as possible, for right now I am preparing the next issue and as usual, time is too tight. I'm the writer of the blog and I would like you to contact me by my email 'dailydelicious@yahoo.com'. This is a great recipe made it twice this week! for this recipe can I substitute butter with oil? Hi, you can use 73g of oil instead of butter.